The best marriage training anyone could ever receive is through helping a married couple when one has a disabling condition requiring caregiving. In the system of services for family caregiving, aging and sudden disability, there is little focus on the pre-existing quality of the marital or committed relationship between the caregiving spouse and the dependent spouse with an illness or disability. In comparison to the financial, medical, and other health needs of someone with an adult onset disability or chronic illness, details of that person’s marital relationship can seem trivial. Yet it plays a major role in the quality of life of the persons involved. I had the honor of closely observing my parents’ marriage, which survived the challenges that come with caregiving and disability, and how they maintained quality in their marriage. …You can be frustrated at how the other person is handling the situation, but at the end of the day, which is it that you really want to quit, the person or the situation? For a real life first person example, one can read a sobering forum post initiated by a spousal caregiver seeking support about the sense of loss of the marriage he once knew with his wife before her stroke, while adjusting to the demanding role of a caregiver. In our situation, my mother had a stroke in 2002 that left her requiring full-time caregiving. She was unable to sit up, walk or go to the bathroom on her own, and, in the beginning, unable to interact or speak with us with full consciousness. She temporarily had a tracheostomy for a ventilator, because she was in in a deep coma for almost three weeks. The brian injury from the stroke led to my mother needing a feeding tube in her stomach as the only way she could be fed for the rest of her life. Although not fully conscious initially, it became clear in time that her speech, although with a raspier voice, as well as her memory and her personality remained intact, with some moments of less emotional self-restraint. Providing care for my mother was demanding and the drastic changes for her required tremendous strength to live through without depression, especially through six cities in four countries. However, the extra, almost 12, years with my mother is so very precious to us all. She watched her only grandson grow up into a teenager. We bonded more as mother and daughter. This was special because I spent some years of my childhood away from my parents due to economic realities of foreign service careers based in countries economically poorer than Western countries. My mother got to age with her dear husband and partner through a lifetime of international transitions and postings. Some of these posting were very challenging, but not as challenging as how they spent their last 12 years together, seven of which my father was her primary caregiver, which especially impacted my parents’ quality of life and marriage. According to a study by Perry Singleton, “couples with lower quality marriages are more likely to divorce than couples with higher quality marriages.” I was blessed to be able to witness my parents’ marriage, seasoned with many victories the surmounted typical marital problems as well the challenges that come with frequent upheavals and transitory nature of a globally nomadic life, survive their final stage of caregiving and disability. 1) My parents did not hold back in being and expressing themselves. Roar loudly when you are going through something significant! Even self-acknowledgement of how you are affected can go a long way. My mother, with her strong personality that most people who know her note about her, didn’t hold back when it came to expressing her needs around my dad. My father on the other hand, who is more reserved and quiet, wasn’t often expressive about his needs. However, he was himself, so when he was silent and when he did speak up, my mother knew what each meant. Their old patterns of communication as a married couple carried over to their life roles as a caregiver and disabled spouse. By not holding back what they felt or needed, my parents rode each wave of tension for as far as they could handle as individuals and as a couple, but they got on the waves and didn’t swim away from them. Yes, not many people would sign up to get on the waves, but they did. As they did, my parents roared loud expressions of how they were being affected, in the form of speaking as well as silence, to stay on those waves. My parents made a decision decades ago, believing a person’s word at the wedding altar meant something beyond the first several years of marriage. They stuck to that decision until the end, and as they approached their last stages of their life together they did so LOUDLY. Roar loudly when you are going through something significant! Even self-acknowledgement of how you are affected can go a long way. 2) My parents lied about quitting each other. …Plan to turn every statement you have made or may ever make about quitting a good relationship or marriage into a big fat lie and make sure the other person knows you will always be lying about that. Did my parents at least at one point each express they wanted to quit either by death or physically leaving? Yes. Afterall, they didn’t hold back from expressing themselves. But at times expressing oneself is just that. Not everything you express outloud is necessarily a threat that has to be carried out. Sometimes expressions are to share frustrations rather than actual plans of action. What can be confused in the expression of frustrations is what each person is frustrated at. Is each person frustrated at the situation or truly the other person? Yes, of course you can be frustrated at how the other person is handling the situation, but at the end of the day, which is it that you really want to quit: the person or the situation? Each time my parents surpassed a conflict, after each wave of tension died down and they roared loudly from where each were at, there was always a new dawn that rekindled their love for one another and there were actually many many more days of laughter and affection than the tension filled days. My parents commitment to one another was more than just a legal decision to permanently stick to something you signed for on a binding contract. Each wave my parents’ surpassed was an elevation to a new level of love for one another. Theirs was the type that seemed to see in each other at least the core value of life of the one they had been the most intimate and vulnerable with, in all the ways two human beings can ever be, with only free will propelling this love forward. At times, this could be the only reason left when fond memories aren’t enough to make you feel the emotions to keep going, especially after looks fade and the life you once shared is a thing of the past. Perhaps not everyone, whether single or married, may experience this love. However, one way to possibly to do so is to plan to turn every statement you have made or may ever make about quitting a good relationship or marriage into a big fat lie and make sure the other person knows you will always be lying about that. 3) My parents’ love knew no boundaries of space and time. 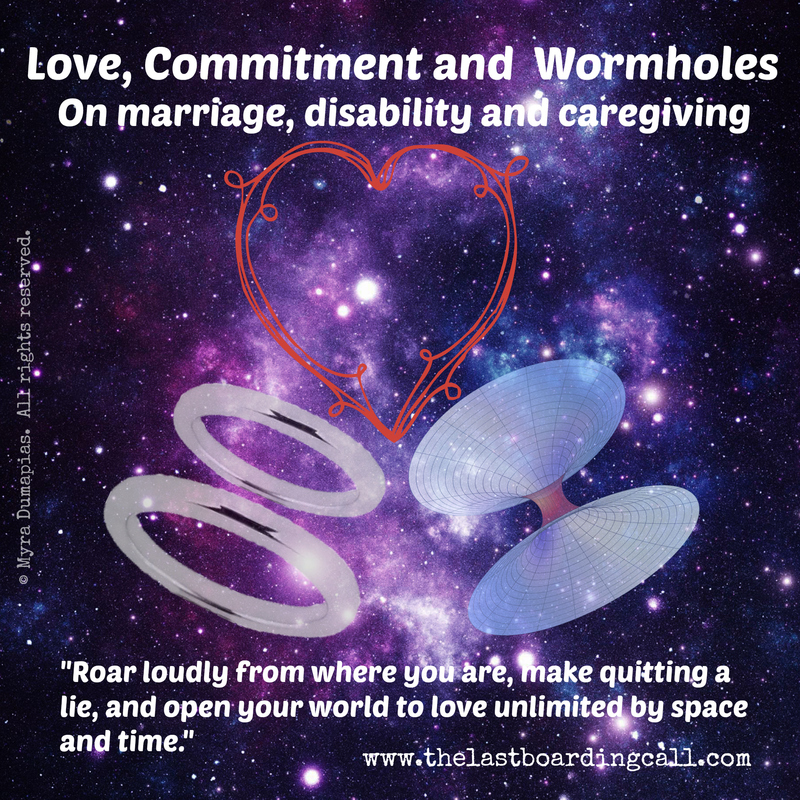 Facing the toughest challenges in a marital or commited relationship may be the key to opening your world up to wormholes, or unimagineable depths of love unlimited by space and time. The most romantic moments I have ever seen between two people in my life were enacted each time I watched my father patiently feed and clean up after my mother, who would reach over to express gratitude through a wordless but overwhelmingly affectionate soft caress of his arm while they looked into each others’ eyes. These were the moments that demonstrated to me why couples ride waves of tension together, loud as the ride may be, then ride another one, and another one until there are no more. They way my parents looked into each others’ eyes during moments like this was the same way they used to look at each other in younger years when both were able bodied and able to travel, eat and move about freely. Their love for each other was timeless. There is one date I remember my parents used to reminisce about before my mother’s stroke. What was cute was the way they would each separately talk about a certain date they had for one of their anniversaries in Seoul, S. Korea. They each, separately, would fondly talk about the same details of that evening: the ceiling painted with clouds, the beautiful and blonde haired harpist playing in the corner and the overall pleasant ambience of the restuarant, all working together as the backdrop of the wonderful time they had with each other that evening – an evening they would both jokingly describe as, “like being in heaven.” Almost 30 years later, my parents still reminisced about this evening with the same fondness for this moment they shared in time. Today, my father recounts the same evening with the same fondness and sentimental value, smiling and laughing at the same details that have only partially illustrated what seems to be a whole universe of an eternal evening full of very special moments for both. It is as if there is a wormhole my parents frequently travelled through because the quality of excitement in my parents eyes, voice and smile they would reminisce with about that one fancy and special anniversary date was always fresh. It was as if that date always just happened the evening before, even after almost 30 years later in a completely different country, right from the comforts of a bedroom set up for an elderly person with a disability. My father says, “you don’t know how deeply you can love someone until you serve them.” Perhaps it is this level of love that helps to makes special moments like this anniversary date eternal. Perhaps it is no coincidence that a married couple tested through the challenges of caregiving and disability, can keep special moments like this fresh and alive. Facing the toughest challenges in a marital or commited relationship may be the key to opening up your world up to wormholes, or unimagineable depths of love unlimited by space and time. In the realm of love, there is space for life that never ends if you don’t let it die with drastic changes in a your beloved’s physical condition or last breath. In the realm of love, space and time do not serve as limitations but as mere background details for eternal moments. In the realm of love, being real includes forever. © Myra Dumapias and The Last Boarding Call. Unauthorized use and/or duplication of this material without express and written permission from this blog’s author is strictly prohibited. Excerpts and links may be used, provided that full and clear credit is given to Myra Dumapias and The Last Boarding Call with appropriate and specific direction to the original content. This entry was posted in Caregiver's Corner, Relationships and tagged aging, CCK, commitment, diplomatic corps, disability, foreign service, global nomad, love, love commitment and wormholes, marriage, marriage and caregiving, myra dumapias, retirement, rodolfo dumaipas, senior citizen, TCK, the last boarding call, three observations about marriage, wormholes. Bookmark the permalink.